Terrarium wood is most popular in the reptile world as they are placed in terrariums. Terrariums have long been apart of society for observing and learning about different types of plants and animals. Often terrariums are metal or wood, however, wood is more popular and gives a little more of a sophisticated look. They can be found for sale on many different websites, reptile and fish stores, and some gardening stores. Or they can be pretty budget-friendly and easy to build yourself, depending on what is going to be going inside. Even reclaimed materials could be used! Typically, terrariums are a standard square shape making it very easy to build out of wood and glass or plexiglass. Although terrariums are typically build in a square they can be build into other shapes and a large variety of sizes; Could be small enough to put on a desk or large enough that it must be outside. When terrariums are built out of wood it is also to give it more of a jungle or dessert like appearance, depending on which type of habitat will be enclosed. However, Wood helps give a better seal and more natural look and feel to where a temperature-controlled environment can be created. 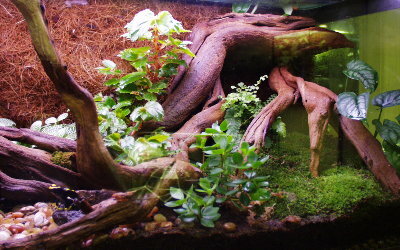 Wood terrariums are most often used for plants such as bromeliads and African Violets; and animals such as reptiles, amphibians, insects, and small birds. Often the wood terrariums that are built are made from plywood that has an epoxy coating on it. The plywood with the epoxy coating is used because it can withstand higher temperatures of humidity than glass or plastic. Choosing which size needed is not going to be solely based off preference, anything that would go inside will need a specified amount of space inside. Within this type of terrarium substrates such as soil, sand, peat, wood mulch, or others could be used in the bottom. There are also many other accessories that can be added on or used in conjunction with these types of terrariums making them a great choice for many different situations.